(2) Grand Prizes: (1) Golf Foursome at the Phoenecian, (1) $200 voucher for lunch at the Phoenecian, (1) Jack Daniel’s Titleist Golf Bag, (1) Herradura Nike Golf Dri Fit Polo, (4) Herradura Pitchfix Golf Bar Markers, (4) packs of Jack Daniel’s Titleist Trusoft Golf Balls, (4) Herradura Golf Visor Hats, (4) Jack Daniel’s Golf Towels. Enter from Sunday, January 20th, 2019 through Sunday, March 31st, 2019. Please know by entering this sweepstakes, you will also be joining our VIP E-Club, our loyalty program where you receive special offers & discounts every month! OFFICIAL RULES MUST BE 21 YEARS OF AGE OR OLDER TO PARTICIPATE. NO PURCHASE OR SMARTPHONE NECESSARY TO ENTER OR WIN. A PURCHASE OR SMARTPHONE ENTRY WILL NOT IMPROVE YOUR CHANCES OF WINNING. Sponsor: Herradura Tequila IMPORTED BY BROWN-FORMAN, LOUISVILLE, KY. Sweepstakes Entry Period: The Sweepstakes will begin on 12:00:01 a.m. Pacific Time (“PT”) on January 20, 2019 and will end at 11:59:59 p.m. PT on March 31, 2019 (“Entry Period”) To be eligible, all entries must be received by Sponsor by March 31, 2019. 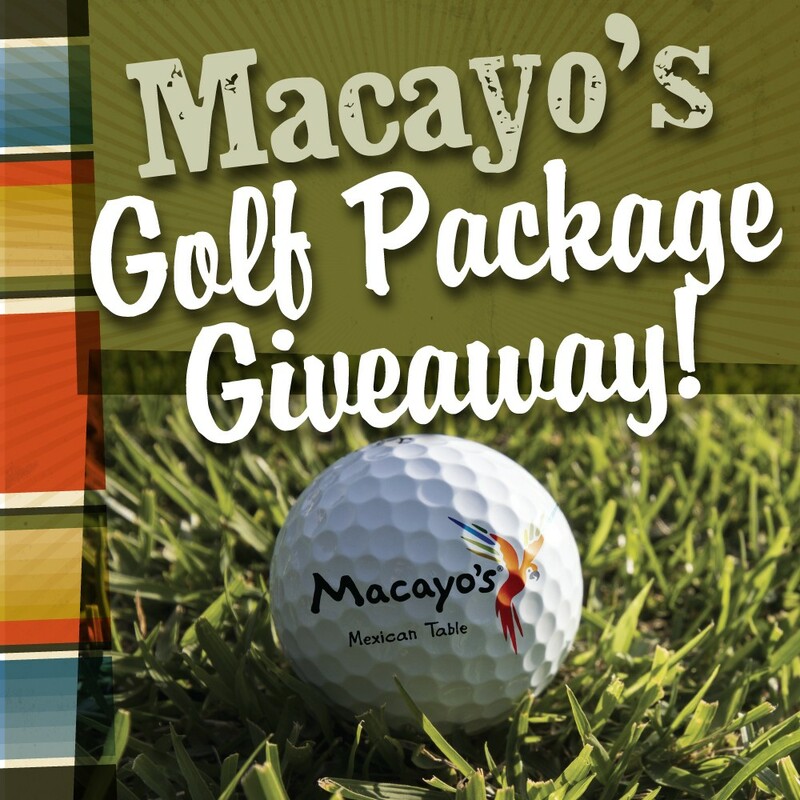 Eligibility: The Macayo’s Golf Giveaway (“Sweepstakes”) is open only to legal residents of the State of Arizona only, and consumer must be age 21 or older at the time of entry. Void where otherwise taxed, prohibited or restricted by law. Officers, directors and employees of Sponsor and affiliates, if applicable, its parents, subsidiaries, and affiliates; individuals or entities responsible for the development, printing, distribution and implementation of this Sweepstakes; suppliers, distributors and retailers of alcohol-beverage products; and individuals who are employees of or members of the immediate family or household, whether or not related, of any of the foregoing are not eligible to enter to win. Sweepstakes is subject to all applicable Federal, state and local laws and regulations. To Enter: Entrants may enter only once. To Enter via a Text Message. Text MACAYO to 55678 and follow the directions to verify your age and state of residence. You will then be sent a text message informing you that you have been officially entered for a chance to win. Standard data fees may apply. See your wireless carrier for pricing plan details. Check your wireless phone capabilities for specific instructions. To Enter via Web Entry. 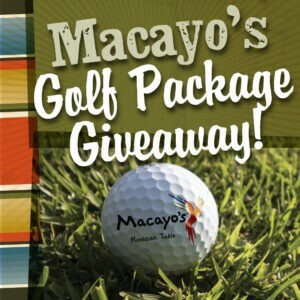 Go to www.Macayo.com/Macayos-Golf-Giveaway/ and enter for a chance to win. GRAND PRIZE: Total Prizes to be awarded: Two (2) Grand Prizes consisting of the following: One (1) golf foursome at the Phoenecian, one (1) $200 voucher for lunch at the Phoenecian, one (1) Jack Daniel’s Titleist Golf Bag, one (1) Herradura Nike Golf Dri Fit Polo, four (4) Herradura Pitchfix Golf Bar Markers, four (4) packs of Jack Daniel’s Titleist Trusoft Golf Balls, four (4) Herradura Golf Visor Hats, four (4) Jack Daniel’s Golf Towels. Winner must be 21 years of age or older at the time of entry. Winner will be selected through a random drawing among all eligible winners, no later than April 5, 2019 Odds of winning a prize will be determined by the total number of eligible entries received. The winner must complete and sign a liability and public release affidavit. Alcohol is not part of any prize. The prize is comprised only of the items specified herein. Any and all other costs and expenses incurred by the Prize Winner including but not limited to lodging, transportation costs, gratuities and any other expenses are the sole responsibility of the Prize Winner(s). The Prize Winner(s) and guest must be at least 21 years old and must be available on the specified, agreed upon date or such Prize Winner(s) will be disqualified, such Prize Winner(s)’s Grand Prize will be forfeited and no substitutions will be offered. No minor will be eligible to win the Grand Prize. The Grand Prize Winner(s) agrees to comply with all applicable regulations in connection with the Grand Prize. The sponsor and venue reserves the right to revoke full or partial prize from any winner or winner’s guest who it or venue personnel deem may, in its sole discretion, be intoxicated, be a safety risk, have violated any venue policy or law, or may bring the sponsor or venue into disrepute. The Grand Prizes are non-transferable and non-assignable, with no cash redemptions except at Sponsor’s sole and absolute discretion. Sponsor reserves the right to substitute any Prize (or any portion thereof) with one of comparable or greater value at its sole and absolute discretion. Alcohol is not part of any prize. Completion of entry authorizes Macayo’s Mexican Restaurants to add you to the Macayo’s VIP E-Club where you will receive exclusive offers, discounts and Macayo News before anyone else. If you provided your mobile number during the promotion period and agreed to the terms listed, you are authorizing Sponsor to deliver automated SMS messages to you about the Sweepstakes. You are not required to provide a number as a condition of purchasing any item or receiving any offers. Standard message rates may apply. You may opt out of receiving future text messages by replying STOP to any message you receive (this will generate a confirmation message noting we have received your request). If you chose not to receive automated SMS messages to your mobile device, you will receive the same notifications via mail or via email through an automated email system. Sponsor and its agents are not responsible for text message entries not received due to lost, failed, delayed or interrupted connections or miscommunications, or to other electronic malfunctions, delays, or errors of any kind in the transmission or receipt of such entries. Sponsor is not responsible for incorrect or inaccurate entry information, whether caused by any human or technological error that may occur in the processing of entries. Any other attempted form of entry not specified herein is prohibited; no automatic, programmed, robotic or similar means of entry are permitted. Network service for transmission of text messages/entries may be interrupted or unavailable due to atmospheric or topographical conditions, governmental regulations or orders, or system capacity limitations. Sponsor assumes no responsibility for message/entry delivery or timeliness of messages/entries, or for the availability of messaging or general phone services at all times. If, for any reason, the Sweepstakes cannot be executed as planned, including, but not limited to, any governmental order, force majeure, social media mandate, printing, administrative or other error of any kind, transmission failure, infection by computer virus, bugs, tampering, unauthorized intervention, fraud, technical failures, or any other causes beyond the control of Sponsor that corrupt or affect the security, administration, fairness, integrity or proper conduct of the Sweepstakes, or if the Sweepstakes is compromised or becomes technically corrupted in any way, electronically or otherwise, Sponsor reserves the right, in its sole discretion, to cancel, modify or terminate the Sweepstakes and, if terminated before the original end date, to select the winner from among all eligible, non-suspect entries received through both entry methods combined as of the date/time of termination. No transfer or substitution of prize (or any portion thereof) or cash redemption permitted, except as provided herein or at Sponsor’s sole discretion. Sponsor reserves the right to substitute a prize (or portion thereof) of equal or greater value in the event that advertised prize (or portion thereof) is unavailable. Sponsor further reserves the right, in its sole discretion, to offer a cash alternative for the prize; however, the cash alternative may be less than the stated ARV of the prize. All federal, state and local income taxes on the prize are winner’s sole responsibility. Winner will be issued an IRS Form 1099 for the value of his/her prize. By accepting the prize, winner waives the right to assert as a cost of winning said prize, any and all costs of redemption or travel to redeem said prize and any and all liability that might arise from redeeming or seeking said prize. Sponsor reserves the right to conduct a background check of any criminal records of any prize winner. To the extent necessary and permitted by law, prize winner shall authorize this background check. Sponsor reserves the right, at its sole discretion, to disqualify any prize winner based on the background check. SPONSOR’S DECISIONS AS TO THE ADMINISTRATION AND OPERATION OF THE SWEEPSTAKES AND THE SELECTION OF POTENTIAL WINNER ARE FINAL AND BINDING IN ALL MATTERS RELATED TO THE SWEEPSTAKES. AN ENTRANT IS NOT A WINNER UNLESS AND UNTIL ENTRANT’S ELIGIBILITY AND THE POTENTIAL WINNING ENTRY HAS BEEN VERIFIED AND ENTRANT HAS BEEN NOTIFIED THAT VERIFICATION IS COMPLETE. SPONSOR WILL NOT ACCEPT SCREEN SHOTS OR OTHER EVIDENCE OF WINNING IN LIEU OF ITS VALIDATION PROCESS. ANY ENTRY THAT OCCURS AFTER THE SYSTEM HAS FAILED FOR ANY REASON IS DEEMED DEFECTIVE AND IS VOID AND WILL NOT BE HONORED. Participation constitutes entrant’s full and unconditional agreement to these Official Rules and Sponsor’s decisions, which are final and binding in all matters related to the Sweepstakes. By entering or accepting the prize (if awarded to him/her), entrant agrees to indemnify, release, defend and hold harmless the Sponsor, and its parent companies, subsidiaries, affiliates and agencies, and the officers, directors and employees of each of the foregoing (collectively, the “Released Parties”), from and against any and all liability for any claims (including but not limited to third-party claims) arising from or relating to loss, harm, damage, injury, cost or expense whatsoever including, without limitation, claims alleging property damage, personal injury (including without limitation emotional distress) and/or death, publicity rights, defamation or invasion of privacy that may arise from or in connection with participation in the Sweepstakes, including but not limited to, prize winner’s Sweepstakes entry; use of prize winner’s name, likeness, biographical information, signature, image or likeness; prize winner’s receipt, possession, acceptance, use and/or misuse or inability to use any prize or part thereof or participation in prize-related activities, including, but not limited to, injury or loss sustained in any travel related to the prize; financial claims; physical and/or emotional injury; and/or any other legal claim that may arise, whether under contract, tort, warranty or any other theory or claim. The Released Parties are not responsible for: (a) any incorrect or inaccurate information, whether caused by entrants, printing errors or by any of the equipment or programming associated with or utilized in the Sweepstakes; (b) technical failures of any kind, including, but not limited to malfunctions, interruptions or disconnections in phone lines or network hardware or software; (c) unauthorized human intervention in any part of the entry process or the Sweepstakes; (d) technical or human error which may occur in the administration of the Sweepstakes or the processing of entries; or (e) any injury or damage to persons or property which may be caused, directly or indirectly, in whole or in part, from entrant’s participation in the Sweepstakes or receipt or use or misuse of the prize. If for any reason an entrant’s entry is confirmed to have been erroneously deleted, lost or otherwise destroyed or corrupted, entrant’s sole remedy is another entry in the Sweepstakes, provided that if it is not possible to award another entry due to discontinuance of the Sweepstakes, or any part of it, for any reason, Sponsor, at its discretion, may elect to hold a random drawing from among all eligible entries received up to the date of discontinuance for any or all of the prizes offered herein. In the event that production, technical, seeding, programming or any other reasons cause more than stated number of prizes as set forth in these Official Rules to be available and/or claimed, Sponsor reserves the right to award only the stated number of prizes by a random drawing among all legitimate, unawarded, eligible prize claims. By accepting the prize, winner acknowledges that Sponsor has neither made, nor is in any manner responsible or liable for, any warranty, representation or guarantee, express or implied, in fact or in law, relative to such prize or any component thereof, including, but not limited to, its quality, mechanical condition or fitness for a particular purpose. By participating or accepting a prize (if applicable), entrants agree that: (a) any and all disputes, claims and causes of action arising out of, or connected with, this Sweepstakes or any prize shall be resolved individually, without resort to any form of class action, and exclusively by the appropriate federal, state or local court located in the State of Connecticut; (b) any and all claims, judgments and awards shall be limited to actual out-of-pocket costs incurred, including, but not limited to, costs associated with entering this Sweepstakes, but in no event attorneys’ fees; and (c) to the extent allowed by applicable law, under no circumstances will entrant be permitted to obtain awards for, and entrant hereby waives all rights to claim punitive, incidental and/or consequential damages and/or any other damages, other than out-of-pocket expenses, and any and all rights to have damages multiplied or otherwise increased. SOME JURISDICTIONS DO NOT ALLOW THE LIMITATIONS OR EXCLUSION OF LIABILITY FOR INCIDENTAL OR CONSEQUENTIAL DAMAGES, SO THE ABOVE MAY NOT APPLY TO YOU. All issues and questions concerning the construction, validity, interpretation and enforceability of these Official Rules, entrants’ rights and obligations, or the rights and obligations of the Sponsor in connection with the Sweepstakes, shall be governed by, and construed in accordance with, the laws of the State of California, without giving effect to any choice of law or conflict of law rules (whether of California or any other jurisdiction), that would cause the application of the laws of any jurisdiction other than California. A winner’s list may be obtained by mailing a self-addressed stamped envelope to: Beverage Promotions, Attention: Macayo’s Golf Giveaway Winner List, 20280 N. 59th Avenue #115-550, Glendale, AZ 85308. All requests for the winner’s list must be postmarked by 7/31/2019 and received by 8/10/2019. Requests will be fulfilled after the winner is verified. Herradura Tequila IMPORTED BY BROWN-FORMAN, LOUISVILLE, KY.